We are confident that we can help you find the ideal leveling foot for your needs. We have a broad selection of pad materials, diameters, with or without holes, as well as a variety of stud lengths, thread types, and anchoring options. Do you have a unique leveling solution in mind, or can't find what you need here on our website? Please contact us today! 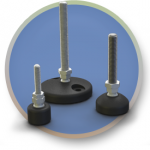 All of our leveling feet come in Die-cast Zinc, Nylon and Stainless Steel varieties. The larger of which (80mm & 100mm pads) are available with holes for bolting directly to a surface.